Show Me The Movies: Review: Deadpool 2 - A sequel to please the die hard fans and maybe earn a few new ones! Review: Deadpool 2 - A sequel to please the die hard fans and maybe earn a few new ones! Two years after the blockbuster smash that was Deadpool, the highly anticipated sequel posed many questions to it's eager audience prior to it's release. Would the sequel hold the same charm and appeal now that the element of surprise of the first film had been removed? Would the endless gags grow tiresome or would the the sharpness and quick wit delivery and charisma of Ryan Reynolds hold up to another outing? What would Josh Brolin, in what until recently, would be a vast role change bring to the production? 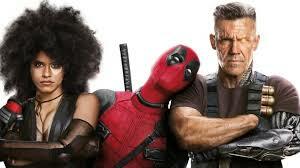 On departing Tralee Omniplex at the end of it's screening I'm pleased to report that all fears were unfounded and Deadpool 2 delivers once again for what is sure to be record box office crowds in it's own unique and highly entertaining way! Deadpool 2 again follows the exploits of foul-mouthed mutant mercenary Wade Wilson (Ryan Reynolds who brings together a team of fellow mutant rogues to protect a young boy of supernatural abilities from the brutal, time-travelling mutant, Cable (Josh Brolin). All the ingredients of the first film that worked so well are here to enjoy once again in Deadpool 2. The breaking of the fourth wall, the vulgarity and hilarity, the queasy violence and stunning visual effects make up all that is great about this film and like all good sequels, it has those extra elements added with the new characters and awesome set pieces elevating this movie to a higher level that is bound to please all fans of the first film and may gather a few new ones along the way. It does come with a warning however, some scenes are extremely graphic and it may not be a film for everyone but fans of the franchise and highly entertaining blockbusters will love it and immediately start counting the days until Deadpool 3.